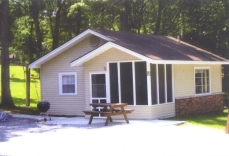 Cottage 5 has two bedrooms, one bath, complete kitchen. A large picture window in the dining/living area overlooks the lake, as does the screened-in porch. The cottage sleeps 4 only. Central heat and air. Also has a cement patio that is not shown in drawing. NO PETS PLEASE. NO SMOKING. Summer 4 people 6/8 thru 8/17 Sat. - Sat.